PREMISE Treated Soil Barrier to AS.3660 ✦ provides immediate protection for the home-owner ✦ termites cannot detect the chemical ✦ some are killed outright upon contact ✦ others survive long enough to transfer the chemical to other termites in the colony nest by mutual feeding habit ✦ with sufficient transfer the entire colony will be eliminated. Premise works quite differently from other termiticide soil treatment products which are designed to repel or keep termites away from a treated soil area, rather than killing them. Termites tunneling in higher concentration Premise treated soil areas abutting the building, are killed outright, within a few hours. Termites tunneling in the outer reaches of a Premise (lower concentration) treated soil area, cannot detect the Premise chemical which readily sticks to the termite's body. These termites remain unaffected for a few days, before sudden death occurs. This delayed lethal effect provides enough time for the Premise chemical to be transferred back to the central colony nest to infect other termites. The "carrier" termites are able to readily spread the Premise chemical to other termites during regular physical contact with other termites in the colony, particularly when working together in close proximity, grooming and feeding other termites, a regular function of their daily life. With "repellant" termiticides, any minute gap in the treated soil can be detected and exploited by the termites to gain entry in the building. This is a major short-coming of the old-fashioned termite control alternatives, far too often, with financially disastrous consequences. Termites cannot detect the Premise chemical as it has no odour, taste or smell to the termites. The "exposed" termites are able to readily spread the Premise chemical to "unexposed" termites during regular physical contact with other termites, particularly when working together in close proximity, grooming and feeding other termites, a regular function of their daily life. CLICK HERE here for the Premise consumer brochure: You bought a House to call Home, not to feed Termites. If you have termites in your property, we recommend you discuss the problem with the neighbors. Obviously, several homes close by each other with a Premise treated soil barrier, will greatly increase the chances of successful termite colony elimination, for the benefit all concerned, excepting the termites. Refer to the CONSUMER ADVICE section, for tips on selecting a reliable pest controller. Recently Bayer conducted the most extensive analysis of a termiticide effectiveness ever conducted in the history of the USA pest control industry. Click here for the brochure: Premise delivers termite elimination. In this study of actual use conditions, Bayer found more than 99% of buildings treated by Premise at full label applications required absolutely NO retreatment throughout a 5 year period following the initial treatment, with no serious re-infestation problems or failure of the product's effectiveness. This is an outstanding result given the tenacity of termite species in the USA and wide variation in technical skills of applicators, climatic conditions, soil compositions and building construction types evident throughout the United States. Bayer claim “there is no technical or commercial reason to use any termiticide other than Premise”. The results tend to speak for themselves. 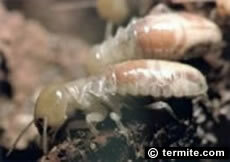 The "Domino Effect" of Premise has been observed through controlled scientific testing on live termites. Extensive testing by the US Dept of Agriculture - Forest Service and the University of Hawaii documented lethal transfer of Premise from exposed to unexposed termites even when they were exposed to 100ppm Imidacloprid - the active constituent chemical in Premise termiticide. As with any termite control program, your property always remains susceptible to future attack from new termite colonies or other established colonies in your area. The good news for the homeowner is that the Premise soil treatment chemical will remain in place for many years even after the existing attack on your property has been eliminated. In brief, Premise treated soil zone acts on an on-going basis to prevent termite entry through a treated soil area into a building or other protected structures. Such a chemical soil zone under and around the external perimeter of a building is a wide continuous target for the foraging termites to encounter, rather than scattered bait stations around the building! The first step in a Premise termite control program is for your termite controller to thoroughly inspect your premises in order to assess the level of infestation and the extent of the threat to your property. Based upon this inspection, the termite controller can recommend exactly where and how the Premise soil treatment should be applied. Premise is a lower cost-effective termite control program - the cost of a Premise program depends on the size and design of the subject building - the extent of the infestation - the risk of further attack and on-going termite activity - and other environmental factors. Where a complete Premise soil treatment is not practical or desired by the property owner - then we recommend the Exterra termite baiting system also be installed. Ring the Experts: The success of a Premise termite control soil treatment depends heavily upon the skill and experience of the termite control specialist engaged. Premise is only available to licensed pest controllers. Same Family Business Since 1964 • FUMAPEST Termite & Pest Control is a second generation family business. After almost 50 years of providing pest control in Hornsby Council Region, we have a valuable reputation to protect and a wealth of knowledge and experience, unmatched by our competitors. BUSINESS ENTERPRISE AWARD • FUMAPEST Termite & Pest Control received a Business Enterprise Award from NSW Govt Office of Small Business & Qantas for development of its EcoSafe Pest Control systems. Accredited APCA Member • FUMAPEST Termite & Pest Control is an Accredited Member and major supporter of the Australian Pest Control Association since 1987. Industry Stewardship • FUMAPEST Managing Director served on NSW Govt Pest Control Licensing Board and Standards Australia Committes for Termite Control AS3660 & Termite Inspection Reports AS4349. Insurance Details • FUMAPEST Termite & Pest Control maintains public liability and professional indemnity insurances to cover personal injury and faulty workmanship of up to $20 million and $1 million respectively. Commercial Food Premises • FUMAPEST Hornsby Pest Control is compliant with Food Act NSW, HACCP & AQIS requirements for commercial food handling premises in Hornsby Council Region • restaurants • cafes • bakeries • backpacker hostels • child care centres • churches • factories • health care facilities • hospitals • hotels • motels • nursing homes • offices • racehorse stables • retirement villages • schools • colleges • veterinary clinics • other sensitive environments • click here for more details. KORDON Termite Barrier for Builders • Manufactured by Bayer Australia • FUMAPEST Termite & Pest Control are Licensed KORDON Installers for building constructions in the Hornsby Council Region • KORDON is CodeMark Accredited and meets Australian Building Code and Hornsby Council termite control requirements for buildings under construction • a 10 year warranty applies backed by Bayer • click here for more details. FUMAPEST Spider Identification Chart with FIRST AID spider bite procedures - a ready reference guide in full colour of dangerous and venomous spiders in the Hornsby region.